← Women in Ministry: What Would People Think? Two of our partners in ministry celebrate vibrant youth ministry outside of involvement in the International Youth Convention, including the National Association’s NIYC (National Inspirational Youth Convention) and the student ministries of the Hispanic Council (Concilio Hispano). For many youth in the Church of God, IYC is not the pinnacle of their year; NIYC or the youth events of the Hispanic Council take that description. It is with great anticipation then, that in 2017, students of IYC, NIYC, and the Hispanic Council will come together for a groundbreaking unity event. ONE will gather youth across ethnic and cultural lines together under the banner of Christ to worship and serve together. When unity becomes more than just talk, incredible things begin to happen. 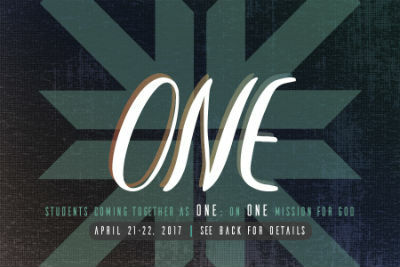 Andy Stephenson, IYC director anticipates a “great testimony to the church and to the world of what God can do when we unite together as ONE.” To be a part of this great testimony, students are invited to Church at the Crossing in Indianapolis, Indiana, April 21–22, 2017. ONE: United Together is expected to commence at 8:00 PM on Friday and conclude at about 4:00 PM on Saturday. Open to high school and middle school students, there will be worship, discussion, learning together, and opportunities to serve side-by-side. Best of all, the experience is affordable—student registration for just $20 also includes lunch. For online registration, visit www.chogy.org. This entry was posted in All Church of God, IYC: International Youth Convention, Youth Ministries and tagged Church at the Crossing, conference, convention, crosscultural, gathering, high school, Indiana, Indianapolis, Kevin Earley, middle school, multicultural, ONE, rally, Ramon Rivera, Reconciliation, student ministries, students, United Together, unity event, youth. Bookmark the permalink.